As fall creeps in and Halloween trick-or-treaters are afoot, it is important to remember that Open Enrollment for the Affordable Care Act begins tomorrow! From November 1st to December 15th, individuals can sign up for coverage on their state’s Health Insurance Marketplace. During the 10-week 2017 Open Enrollment period, 12.2 million Americans got coverage through a marketplace plan and 550,000 of those Americans reside in the South. Open Enrollment marks a time when individuals not only seek health coverage, but also move forward in their personal and professional pursuits, with protection from the health obstacles that can, too often, turn into health tragedies. Although millions of Americans will sign up for a health insurance plan during these coming months, approximately 27.3 million Americans still do not have health insurance. A disproportionate share of these individuals resides in the South—a region characterized by its poor health outcomes and long-held resistance to federal expansion of health care benefits. Currently, nine of the 13 Southern states have not expanded Medicaid. This choice explains the large Southern contribution to the uninsured population as well as the coverage gap—individuals who are currently uninsured who would qualify for Medicaid if their state expanded coverage. Arguably, the region could use all the resources available to help tackle the high prevalence of chronic conditions such as obesity, diabetes, and hypertension. Reduced funding for enrollment advertising: The Federal advertising budget has been reduced from 100 million to 10 million. Reduced funding for federal enrollment groups: The Federal navigator budget has been reduced 41 percent with Southern and Midwestern states being hit even harder. Reduced website availability during open enrollment: Every Sunday for a 12-hour period during the open enrollment period, healthcare.gov will be down for maintenance and individuals will be unable to sign up for an insurance plan. Elimination of cost-sharing payments to insurance companies: While consumers who are eligible can still gain access to this additional form of financial help (in the form of lower deductibles, copays, coinsurance, and out-of-pocket maximums), the net result of ending these payments is that insurance companies already priced in the lost revenue into their premiums – the individuals who are most negatively affected are those who are not eligible for financial assistance. A recent bipartisan bill presented by U.S. Sens. Lamar Alexander and Patty Murray holds the possibility of addressing some of these changes, but given the backlog in the legislative calendar, and the fact that the Open Enrollment Period is almost underway, the prospects for a deal are not particularly good. These changes will exacerbate financial constraints and decrease choices for consumers. Fortunately, there are groups across the country that are leading community-driven efforts to improve access to health insurance and affordable health care. Just this past week, public health students at North Carolina Central University organized a panel discussion on the state of health policy in America, with a goal of raising timely questions about current inequities in our system. 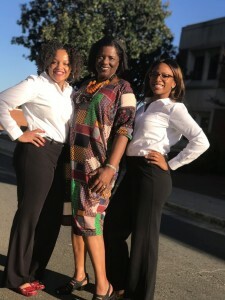 Professor Reid and two of her students pose for a photo after the panel. This event was part of a semester-long engagement to understand the policies and implications of the Affordable Care Act and other health legislation taught by Professor La Verne Reid. These students, our future public health practitioners, are also in the process of translating their dialogue into action by helping community members connect to in-person assistance during the Open Enrollment Period. Their support, alongside the work of ACA navigators and other grassroots organizers, will be crucial to closing the advertising and in-person capacity gaps resulting from reduced federal grant funding. Students will place more than a thousand calls to consumers over the coming weeks to encourage North Carolina residents to secure in-person appointments with an expert to help them navigate their plan options. With continued threats to the Affordable Care Act, the future of health policy in America remains uncertain. For those concerned with the health and economic well-being of Southerners, and all Americans, important questions remain about affordability, equity, inclusion, and transparency in our health care system. For more information about 2018 marketplace plans, visit healthcare.gov. For an application checklist, click here. For NC consumers, please call 855-733-3711 for an in-person appointment, or go online to nchealthconnect.org.